It’s overwhelming that even though you move away from a small community that they still look and follow you, not just what you did in high school, but they still watch you grow." Participation in collegiate sports can be quite a balancing act along with a full academic load, something Holton native and former NFL strength and conditioning coach Russ Riederer knows all too well. That is why Riederer and his family have set up a scholarship in memory of his late mother, Ramona, to recognize individuals with roots in the Holton community at the Division II or NAIA level who are continuing their athletic and academic careers. With this scholarship, the Riederer family college scholar athlete award, Riederer notes he intends to reward student-athletes currently enrolled in college who are working towards finishing their degrees. A particular amount for the scholarship has not been determined at this point in time as half of the fund is going towards a scholarship for Topeka West High School students (where Riederer’s three nephews attended school). The scholarship will also be co-sponsored by The Holton Recorder, where Ramona Riederer worked for 29 years. In addition, to supplement the scholarship fund, Riederer noted he will start asking for donations when he makes speaking appearances at camps and elsewhere across the country. 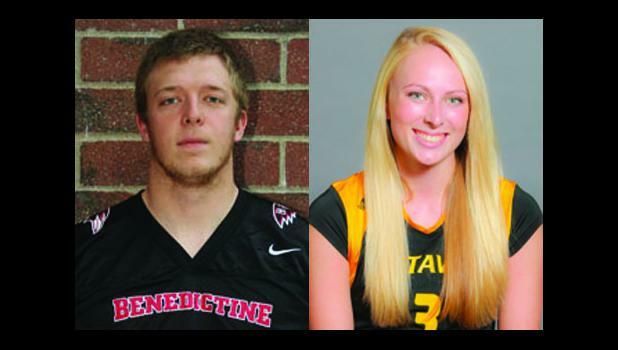 The first recipients of the award embody the spirit of the scholarship, as Bryce Barnett (Benedictine College) and Christa Hill (Ottawa University) have been hard at work on the field, the court and in the classroom as they enter their senior seasons. Barnett will be a fifth-year senior for the Ravens this fall and the former Wildcat football player is coming off a year in which he played in all 11 games for Benedictine at defensive back while recording 25 tackles and two interceptions. Going into this season, Barnett was voted on to be a defensive captain for the team and he said he will try to reciprocate that by giving 100 percent each time out for his teammates and to live up to this scholarship. Considering his off-the-field work, giving 100 percent in his final season should be no problem for Barnett, who has already graduated with bachelors degrees in business management and physical education (with an emphasis in sports management). The HHS grad also recently completed an internship with the Kansas City Royals’ AAA minor league affiliate, the Omaha Storm Chasers, and will be serving as an intern with the Benedictine athletic department this coming year. Barnett noted this scholarship will also help him as he works through two years of graduate classes in pursuit of his masters of business administration to help him become a business leader in the community. Similarly, Hill pointed out the ways the scholarship would help her as she is wrapping up her exercise science degree at Ottawa before she looks to get into physical therapy school at either the University of Kansas, Wichita State University or University of Saint Mary. The current senior noted she would like to take some time and help out at Holton Community Hospital before doing that and potentially get into coaching (an opportunity that could be available at Saint Mary), but first she will close out her career with the Braves this fall. Following her 2014 campaign, it’d be hard not to recognize Hill solely for her accomplishments on the volleyball court, as she was named either player or setter of the week in the Kansas Collegiate Athletic Conference a total of nine times and she also earned NAIA player of the week honors once. Through the course of the season, Hill broke an Ottawa school record with 71 assists in one match against the aforementioned Saint Mary and pushed into fourth in the record books with 2,004 assists (and counting) for her career. She was named the KCAC Setter of the Year and first team All-Conference at the end of the season. Hill credited her coaches at Ottawa for her all-around development in 2014 and she said she is looking to push even further this fall, even with just one-fourth of the team returning from a season ago. A date with Park University on this year’s schedule is another motivating factor, Hill said, as the Pirates are the defending NAIA national champions and went 40-0 in 2014. First and foremost, Hill wants to contend with the defending champs and then look to capture a conference title for the Braves and do something no other Ottawa team has done, make it out of the first round of the National Tournament. Through it all, the former Wildcat noted what has meant the most is the continued connection to the Holton community, whether it’s having the high school team come watch Ottawa play or continuing to compete with a former HHS teammate (Keri Tanking). That, Hill said, makes this scholarship resonate even more. “It’s overwhelming that even though you move away from a small community that they still look and follow you, not just what you did in high school, but they still watch you grow,” Hill said. Moving forward, the Riederer family college scholar athlete award will be given annually to one male and one female student-athlete who meets the previously outlined criteria.